I'm 72 and have some high-frequency hearing loss. Bought a new SUHD Samsung TV and would like to improve dialogue as well have a nice music system (no hard rock). I am definitely not an audiophile (it's like a foreign language). Thinking about Quintet set of speakers (like the size) and using an old Mirage BPS100 sub that I already have to make up a 5.1 system. Might want to add Atmos speakers at a later date. Maybe a Yamaha RX-V581 avr that will also permit an outdoor patio zone. Will this be an improvement over 70s era Yamaha CR-840 avr and 2.1 Edge wall/Mirage sub that I am now using ? Room is about 13 x 15 and partially open on both ends. I'd first suggest against the quintet if your only interest is in size. I'd suggest looking for a set of RSX speakers on the used market. They're a little bit bigger, but offer much more in SQ than the Quintets could possibly offer you. The cost should be about the same to a little less. Onto the receiver. Yamaha's only decent line right now is AVENTAGE (RX-A). The RX-V line has been saturated to the point that it's quality is generally equal to it's HTR line. If you want to go Yamaha, I'd at least recommend the RX-A740 or 50 at the least. Most middle ground and better AVR's will supply you with multiple zones for speakers, so I wouldn't worry about that. The big question is though: what is your budget? Quintets were originally computer speakers. Voiced for close listening. I can't imagine they could fill a 13 x 15 room. You will be happier with larger speakers that have enough output to fill the room and still have low distortion, something like an RB-5. It having obvious speakers is a WAF problem, Klipsch makes some in wall and in ceiling speakers capable of doing the job. Personally, I'd be looking at Denon receivers, 100 watts+. Matching the sound quality of '70s Yamahas will not come easy. Thinking about Quintet set of speakers (like the size) and using an old Mirage BPS100 sub that I already have to make up a 5.1 system. Might want to add Atmos speakers at a later date. Room is about 13 x 15 and partially open on both ends. Without knowing a budget it's kind of hard to recommend one speaker versus another... But since you mentioned the Quintet, you may want to look at some of the bookshelf models Klipsch currently has available as they are closest in size. 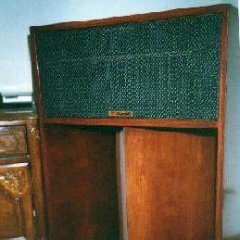 But, as the others have mentioned, the Quintet is really designed as a computer speaker, and would have a tough time filling your room unless you listen at very low levels. Here are some links to the smaller reference bookshelf models that may work for you in a matched 5 channel surround setup. As far as receivers, if you spend $400 or more you can find a good basic AVR that will meet your needs... From most of the name brands. However, if you wanted an Atmos capable AVR for future needs, then you're going to have to spend more money. Better to decide now than wait and have to buy another AVR a few years down the road.